Opalanga Pugh was an ordinary person with an extraordinary life, much of which she created and directed herself. Born in Denver, Colorado, in 1952, when people of color struggled against discrimination and limitations on their life choices, by 1972 she’d renamed herself after her Nigerian ancestors and begun her mission of storytelling. Over six feet tall, chocolate brown, she carried herself like an empress. The gap between her front teeth, something that orthodontists would have wanted to correct, became a point of pride. In Africa the gap was associated with truth tellers. That she was, but she couched the truth in stories, complemented by music and movement—from native peoples, from American culture, wherever a tale spoke to her. I once saw her speak to a group of some 75 women, mostly white and older. By the end of her presentation she was leading a line of all of us up and down the halls, around the rooms, in a joyous, joint celebration. She said, “Who I am as a storyteller is one who is committed to the healing, the empowerment, and celebration of the human spirit. . .a Keeper of the Culture, a bridge-mother.” Known as a “griot,” a term and its variations used in West Africa for “storyteller,” she told her stories in ways that all peoples could understand and relate to. She wasn’t with us long enough. She passed away in 2010 after a lengthy struggle, surrounded by close friends and family who had formed a network of support, provided day and night. 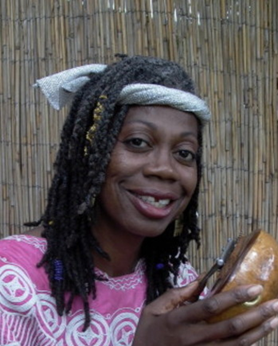 Now those people have published, “When a Griot Dies,” a small book about her life, her journey, her spirit. Proceeds from its sale ($22 a copy) support the Opalanga Legacy Project, scholarships for all sorts of artists, keepers of the culture who honor her values. This entry was posted in News, To Think About and tagged Africa, culture, griot, Opalanga, story, storytelling, value of stories by Bonnie McCune. Bookmark the permalink.